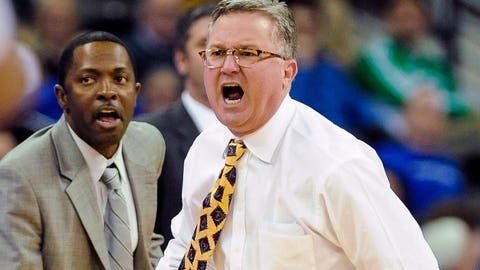 Southern Illinois Salukis head coach Barry Hinson (right) gave us an epic tirade on Tuesday. "We’re soft, we’ve been enabled. For whatever reason, I’ve got a bunch of mamas boys right now." "My wife can score more than two buckets on 11 shots because I know my wife will at least shot fake one time, but those guys aren’t listening. They’re uncoachable right now." "When you have a young team it’s a lot like house training a puppy dog. You know what when the dog does something wrong, you know, bad dog. Get on the treadmill." That last bit puts Hinson in the upper echelon of coaching rants, in our humble opinion.